Its time for another weekly(ish) update on DSP progress. The last week I have been mainly focused on content creation. Surreal contributed 3 new maps for River TD, so you can fight on different (harder!) rivers. 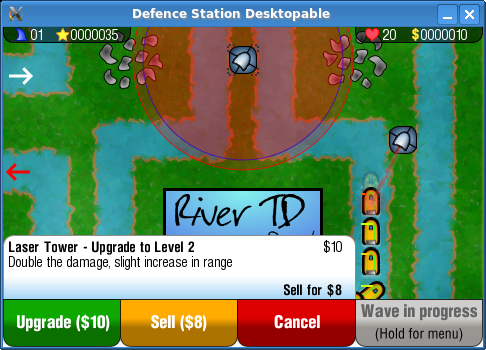 River TD now has 46 enemies, all hand crafted by myself. Fixed 100% CPU usage in windows. Range ring improvements – Draw them Anti-Aliased, don’t show both when upgrading if you don’t need to. This entry was posted in DSP, PSP on January 4, 2009 by Danzel. OMG mate, just release it already. 🙁 PSP has no games and I’m lé bored. WOOT!! ^^ Happy to hear. just waiting to start my new maps.